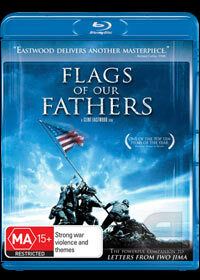 Directed by Client Eastwood, Flags of Our Fathers is based on the book of the same name by Ron Powers and James Bradley which begins during the closing moments of the battle of Iwo Jima. What made this battle so legendary was a photos taken of a group of American soldiers hoisting the flag of the United States of America on Japanese soil. This magnificent photo became an inspiration for Americans and the three "surviving" men who raised the flag have become war heroes, although they are struggling with effects of this war. Starring Ryan Philippe as John Bradley, Jesse Bradford as Rene Gagnon and Adam Beach as Ira Hayes, questions are raised about those who sacrificed their life and whether they should be classed as war heroes. The film is quite critical of war and the impact this photo had not only on the individuals involved but society itself is gripping from start to finish, however for those believing that this may be the next Saving Private Ryan should look elsewhere as this movie is about the individuals and not the war itself per se. Featuring strong elements of politics and the justification of war, Flags of Our Fathers truly gives a human face to the gruesome aspects of war. Apart from the strong story and directing by Eastwood, what sets this movie apart from others is the video presentation which simply looks amazing on Blu-ray thanks to its 1080p presentation with solid black levels, exceptional sharp images and vibrant colours. The audio features Dolby Digital 5.1 which is quite crisp and clear that matches the soundtrack perfectly. The early war scenes almost make you feel like you are part of World War II and really needs to be heard on a surround sound system to be not only enjoyed but also appreciated. The Blu-ray edition also features a wide gamut of interesting special features that are not forced or contrived but are actually quite immersive and interesting. Just look below for the amount of content available. words on the page - Clint Eastwood along with screenwriters Paul Haggis, William Broyles and writer James Bradley discuss the creation of the book and the adaptation of the script, along with the challenges and victories each possessed. six brave men - Clint Eastwood and the key cast members introduce us to the real- life characters portrayed in the film; including their roles in the historic events and their relationships to one another. the making of an epic - led by Clint Eastwood, we take an inside look at the creation of the film with many of the key players involve d, including the production design with Henry Bumstead; the photography with tom stern; editorial with Joel Cox; and the rest of the team that brought this epic film together. raising the flag - Clint Eastwood and key cast members discuss reenacting the historic flag-raising on Iwo Jima. visual effects - the visual effects team (including visual effects supervisor Michael Owens, and Julian Levi and Mathew Butler of digital domain) discusses the approach and creation of the “invisible” digital effects in the film, including before and after examples, as well as the various steps taken to realize them. looking into the past - a documentary, real- life look at the battle, the two flag raisings at Iwo Jima and the resulting bond tour, using historical footage and newsreels. In conclusion Flags of Our Fathers is not a glorified war movie, however is about the impact of war on individuals and how politics and society interpret war for their own agendas. Definitely a powerful story that could be watched time and time again that is presented in glorious high definition which is a must have Blu-ray disc.